When I was a kid, I remember my dad cutting out the “Love Is…” cartoons from the paper and giving them to my mom. They were stuck to the refrigerator, taped inside the cabinets, and tacked to the cork board in the kitchen. To this day, every time I see one, I think of my parents. Love is a lot of things. Easy is not one of them. No matter what kind – romantic, family, or friendship – love takes work. It requires compassion, understanding, and forgiveness. Love can’t be one-sided, but instead must be a collaboration of hearts and minds. Love can make you feel enchanted and as if you are floating through the clouds or it can leave you in a crumpled heap on the floor drowning in your own tears. Actually, love is a lot like cooking. I cook alone. Well, except for Murphy who sometimes stays curled up on the floor at my feet waiting for handouts. But this weekend, I had the opportunity to share my Found Recipe Box cooking experience with a good friend. My husband and I traveled to Milwaukee, WI to visit friends from college. While the boys were at a basketball game, my friend Ginger and I took on the challenge of making Marzipan Valentine Dessert. This recipe consists of a homemade sponge cake, marzipan and whipped cream. The sponge cake recipe instructs you to bake the cake then cut it into the shape of a heart. 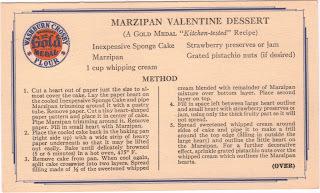 Since this recipe was printed sometime in the 20's, 30's or 40's, they didn’t have the luxury of fancy cake pans already in the shape of hearts. I cheated and used one of those. However, I chose a pan one-size too big, which caused the cake to be thinner than the recipe suggested. Ginger and I decided we’d make some adjustments later and moved on to the marzipan. After creating a concoction that we weren’t sure was actually marzipan and several unsuccessful attempts at trying to load the sticky mixture into a pastry bag, we were finally able to pipe an edging around the outside of the cooled cake and place another heart in the middle. It was messy and dripping down the sides but we thought, hey, who cares….we made a sponge cake and marzipan from scratch! We topped the cake with homemade whipped cream and strawberry jam (our cake didn’t have a second layer and filling due to it being so thin) and when the boys got home from their game, we tasted our creation. It may not have been the most beautiful cake ever baked, but it surely tasted divine. And while I was savoring each bite, I thought of love. 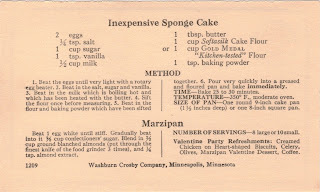 Love can be messy sometimes too, but when we tackle it together, the outcome can be as delicious as a marzipan sponge cake made from scratch. The next day my parents drove up from Illinois to meet Ryan and me for lunch. I feel lucky that my parents are still together and that I’ve had such great role models for my own marriage. Like every marriage, they’ve celebrated great joys and faced hardships. But they’ve traveled that road together and when they’ve come up against a wall (like a thin cake that can’t be split into two layers as the recipe instructs), they’ve made adjustments and come though to the other side with something as good, if not better, than what they originally aimed for. I don’t see Valentine’s Day as a day to celebrate only romantic love, but family and friends as well. And don’t forget your pets! 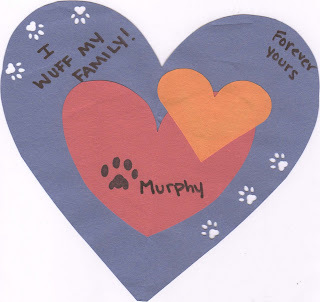 While Murphy was at camp (that’s what we call the kennel because he gets to play with his friends and it’s his most favorite place in the whole world) he made us a Valentine card. He’s such a talented dog. This weekend, I celebrated love and realized that it is a lot of things: a cuddly Golden Retriever, a wonderful husband, friends who stand by you no matter what, parents who are not only role models, but also your best friends, and scrumptious cake. And together, they are the ingredients for a lifetime filled with love and happiness.